input would be most appreciated. > input would be most appreciated. is still being used in new patent applications. >> input would be most appreciated. This is only my opinion, but I wondered if it was a sort of generic term, like Philodendron Schott- but let me hasten to say taxonomy is not my field at all!? I do have a special interest in Zantedeschia, however.? I know the name Zantedeschia hybrid or 'Mini Callas' don't sit well with me, they are not worthy of these beautiful plants. You just don't see other hybrids or colored flowers referred to that way. As an example, tulips have many varieties, they are listed as Tulip 'Apricot Beauty' or whatever, not Tulip hybrid 'Apricot Beauty'. Zantedeschia are so confusing to the average (US) gardener- Giant Calla, Mini Calla, hybrids- grow them in a pond, don't let them get too wet, I get questions about them all the time.? Those of you on Dave's Garden or especially Garden Web know what I mean! Something should be done with the names- if nothing else, it will make them more marketable! > I figured it had to be a synonym...interesting that the name Z. > is still being used in new patent applications. >>> if this is a valid species, and if so, where has it been hiding? >>> input would be most appreciated. Allow me to thank you for sharing this true treasure with all of us at aroid-l! Tony AND Susan must be VERY happy aroidophiles today! This illustrates the wonderful Botanical art that was done ''back in the day'', 1898 in this case. 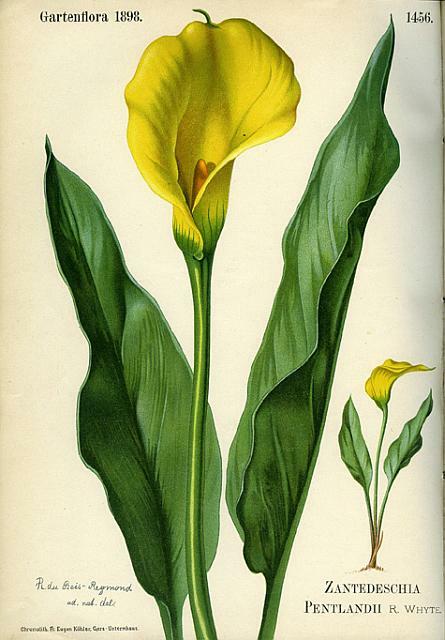 The only other example of art in this quality which comes to mind at this moment (it is early here in WPB), and which were created in the past few years are the color illustrations done by the masters at Kew, which illustrate Peter Boyce`s fantastic book on the genus Arum! As I have said time and time again, even if you are NOT an Arum person, this small book is well worth the investement (under U.S.$100.00?) just for the art!